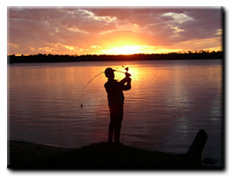 Manitoba's progressive fish management combined with strong conservation and selective harvest programs make it a world leader in sport fishing. Visiting anglers can count on a ready supply of trophy fish. Surrounded by sweeping clear-blue skies and pristine wilderness, anglers test their skills, savour a shore lunch and return home with a catch. Manitoba preserves these fishing traditions through conservation practices and the support of anglers from around the world. Over the last 20 years,cameras and tape measures have become a regular part of every angler's tackle. A quick set of measurements and the click of the camera are proof of the battles won. Using fishing resources with care and respect will guarantee world-class angling adventures for years to come.